or "What are they saying?" As I sit down to type this page I can hear the toms in the back yard gobbling at a warbling fire engine alarm--I call it a "reaction gobble"
An hour before sunrise I slipped the baby bird under the hen and she was so happy that she immediately began making soothing cooing sounds to her new baby. That was kind of of neat, although it was also scary because we have had fox troubles lately. However the hen settled down to warm 'her' baby and I relocated both to a secure pen in the afternoon. The point being that the mother began talking to her baby immediately. 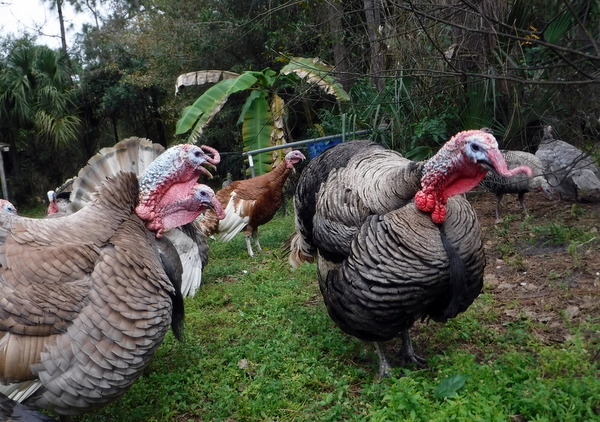 Turkeys have an amazing lexicon: Yelps, clucks, chirps and of course the classic Gobble. The vocabulary varies from alarms, to social context, to an involuntary cackle when flying down from the roost. Body language "We don't like cats but old dogs are acceptable"
Our days spent outside with turkeys - interacting, observing and on occasion dancing; we have had the wonderful opportunity to learn a fair amount of knowledge about turkey behavior, their calls, alarms, whistles & odd noises they make and especially why they make those sounds. And rather than invent a new description of those turkey noises; I will stick to the standard accepted terms that describe turkey talk as in found in the hobby of turkey hunting. Turkey hunters have an impressive understanding of turkey vocabulary that is well documented and videoed. And be the birds domesticated or wild, turkey talk is all the same. Although this link in not from a hunting site it has excellent recordings of turkey calls and sounds. I placed this link high up on the page, because the recordings and the written descriptions work hand in hand. Neck extended for the all important gobble! 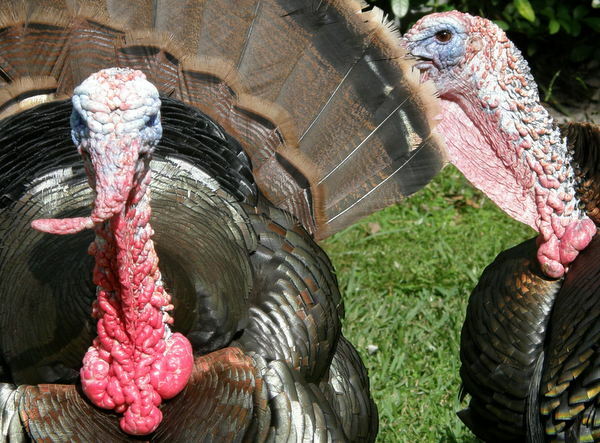 The Gobble is the classic well recognized mating call of the male (Tom) turkey. 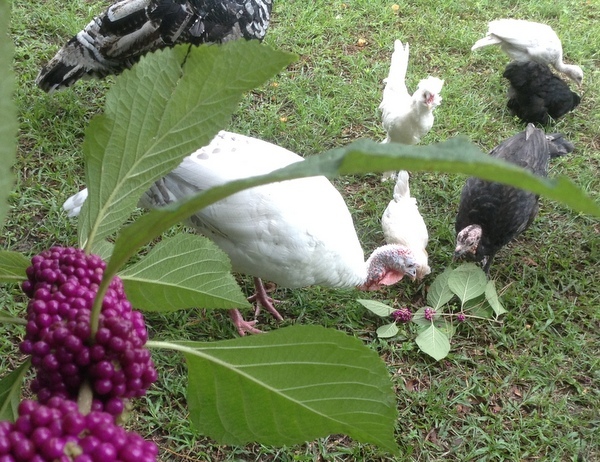 The gobble is used to attract hens and send out a challenge to other Toms. 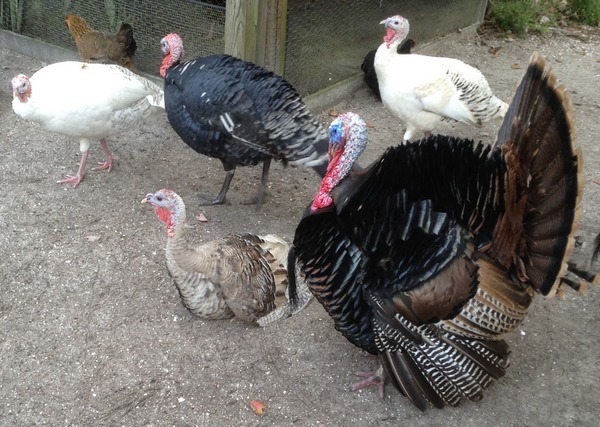 However Toms also just love to hear themselves make noise and to gobble in response to external noises. The siren of a fire truck or ambulance will make the toms go crazy attempting to match the siren. The classic example is a gobble in response to an owl hoot. 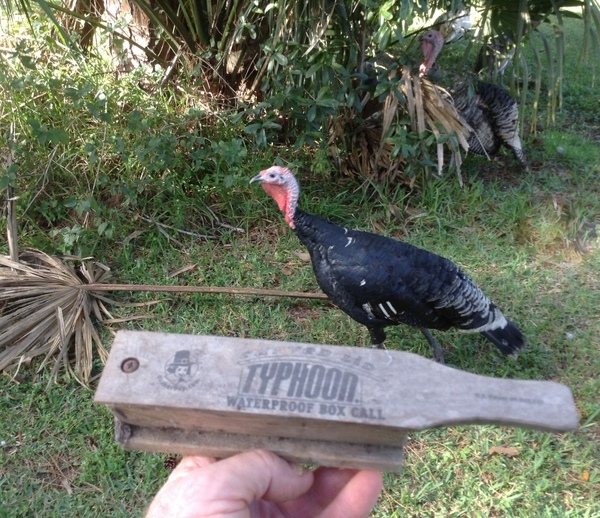 My old turkey box call--gives Yelps that would cause the Toms to come crashing into my hide-spot! 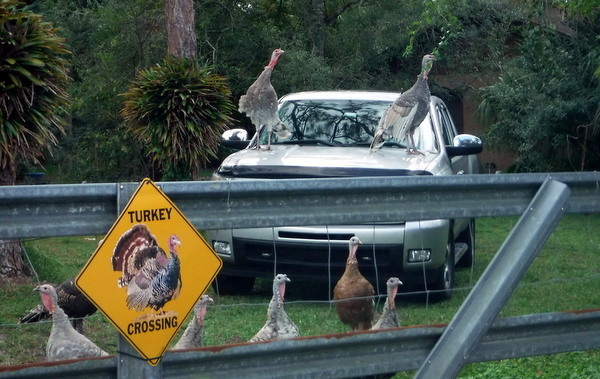 The Lost yelp is the call I was taught as a teen ager to attract turkeys and it works amazingly well. Sort of sad call with hints of panic and desperation..
Another yelp which we hear every morning is the tree yelp-called out while the birds are still perching but not quite light enough to fly to the ground. The tree yelp, could be thought of in terms of “hey good morning you all” Normally this comes out in 3-6 notes with no alarm hinted at unless an answering yelp is not heard and then the gradually increases in duration and intensity. 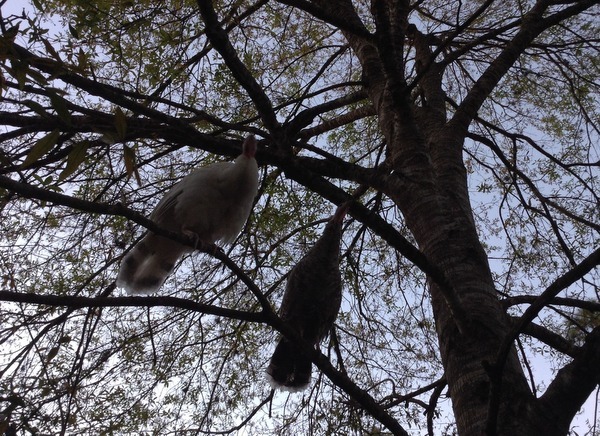 These turkeys will call out the fly down cackle when leaving the tree. The Fly down Cackle The flying cackle is articulated (yelling?) series of irregularly spaced loud notes used by a turkey when flying up or down from the roost. Normally you can tell that it is not called in panic, but it is more of a (in people terms-an exertion grunt) The fly down cackle is a little different with each bird & sometimes it is only single note (think karate mater breaking a board--which is similar to a 8 pound hen taking flight). On occasion we do hear the fly down cackle in expressed -if at 2 am the birds are fleeing the roost minus a few feathers because a raccoon is grasping for dinner. Those panicked cackles are what drives our guard dog Rocky crazy! This morning I was out at dawn looking for a fox that has killed a turkey hen and two chickens in the last few weeks. 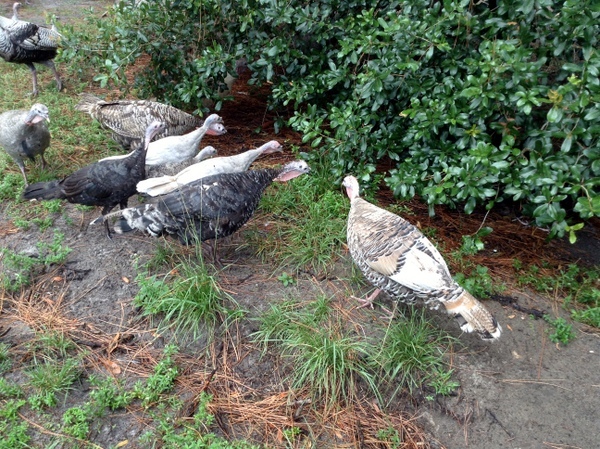 The turkeys were still on the roost- sounding off soft "Tree-Yelps"-sort of a "Good morning everyone" light call. However as I watched the birds fly out of the tree-some giving only a single harsh call and others the staccato normal fly-down cackle: I noticed only the hens gave off the call. My only guess is the hens, "fly" out of the tree and hence their exertion cackle. The toms however were silent as they dropped from the tree. The boys "glided" out of the tree, like heavy space shuttles and had ungraceful landings. As I think about it, I cannot recall a male ever uttering the fly-down cackle. Rio Grande poult getting some sun! The Kee-Kee sound is the normal whistle/chirp of the young poult. Mostly it is just a calm call saying “Here I am, where you are?” And it is often continuous. However the pitch and speed of the Kee-Kee will change if say, I toss a piece of banana to the little birds and they are happy/thrilled to have found a snack. However if the Poults realize they have lost their mom or their siblings, the Kee-Kee become loud and frantic. Not quite panic, just upset. Note: I’m not really agreeing that the “Kee-Kee” ranges from normal, to happy, to outright worry. (To me it is three separate moods/noises) but that is the accepted definition from the turkey hunting crowd. Far be it for me to question their turkey Lexicon! I do note that adults and juveniles alike emit happy whistles when getting a tasty snack. The Kee-Kee is also used by the small birds when on roost for the night and are happy. Whereas "I'm lost" Kee-Kee stretches the sound out like a plaintive wail, the happy "I'm on the perch" Kee-Kee sounds more like a flock of noisy sparrows. Just happy little dinosaurs. So tonight as I did a final check on the birds (as mentioned 'fox' problems) a little bourbon red poult that likes me, "Kee-Kee'd" when seeing me. It was a happy-almost inquisitive sound & repeated the sound back (the way I hear it) as "Peee-Peee". As mentioned to me, only the plaintive 'I'm lost" call sounds like the Kee-Kee noise. Video Clip of Turkey hen sounding the alarm. Several sharp "Cuts"
When I played this video in the house, Rocky went nuts as he knows all the turkey alarms. Clucks are calls not so sharp as the putt, but is almost questioning their environment. Like a person saying “hey” or “what” Or a turkey seeing a shadow move, but not knowing if it is danger. Cut or Cutting, a faster set of notes that the putt alarm. Added the link again to the turkey sounds. Turkey sounds if anyone wants to listen to all three. If anyone can offer up a better description, I will added it! Happy sounds for good chow! A normal Purr is just how you would imagine it would be: fluttering soft, rolling notes expressing both contentment from the bird purring and reassuring their flock mates all is good. Today I let a mom and her two day old poults out to do a dust bath and as soon as she fluffed the warm sand on her wings, she expressed a quick happy purr! 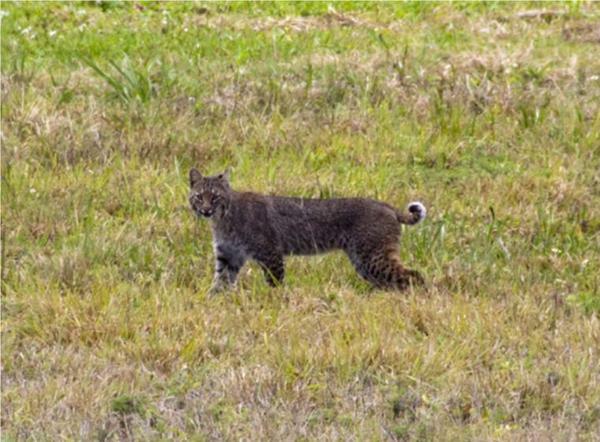 However as a "happy" sound this noise was more of a quick, sharp rattling purr-- not quite a chirp, but not really a purr. The Whine. Something that sounds just as you would imagine it. Most often heard when a high flying buzzard or eagle is soaring over head. 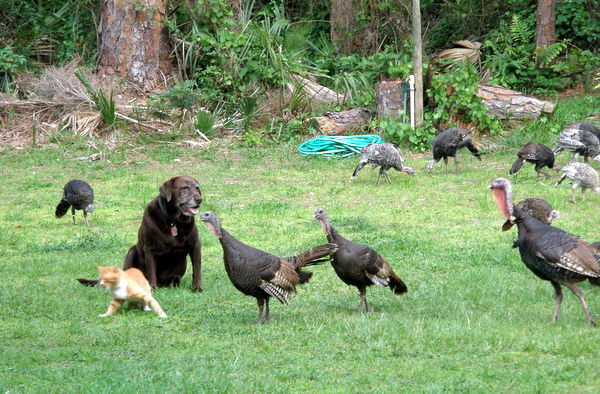 I will hear the whine, look up and that turkey buzzard will just barely be visible! Yet the hen will be whining. Of course if the buzzard or Raptor were close, it would be an alarm called, not a whine. The Owl growl (combination gobble/snarl) when an owl has the audacity to land in the Roost tree. The "Chuff-puff sound that impresses the ladies or so the Toms think. The raptor warning call to flock or poults. Causes chickens and turkeys alike to scatter and sometimes it is only a Sand Hll crane or Great blue heron. Video Clip of a Jurassic Park type Turkey Growl. I don't have a name for this. The sound starts at the 13 second frame. 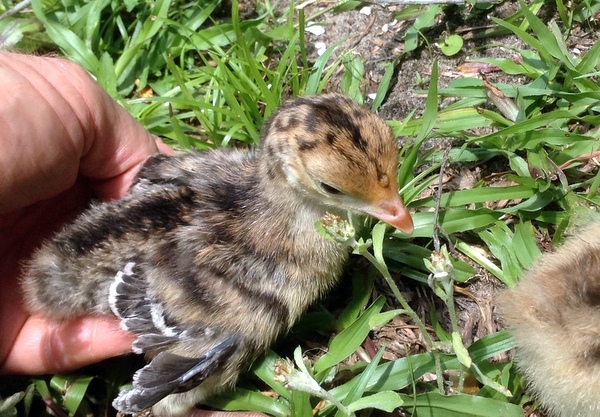 Finally note: Please read in the turkey miracle page about talking to those eggs in the incubator.